I’m sometimes asked what do I most enjoy about visiting bookstores. My first thought is the excitement of possibly finding a book that I’ve been searching for or a book that I’d not realized that I was searching for. Usually it’s one signed by the author or an older paperback that can only be found in an independent bookstore. Yet, I’ve developed a deeper joy in the discovery of bookstores that have personality. That is to say that when walking into a store, I feel welcomed and invited to learn its story–like making a new friend. Not all bookstores have a character that extends beyond the anonymous store. In fact, some stores want customers to feel like each of their stores are the same, with item location in the same place regardless of where you visit, or menu you choose from. 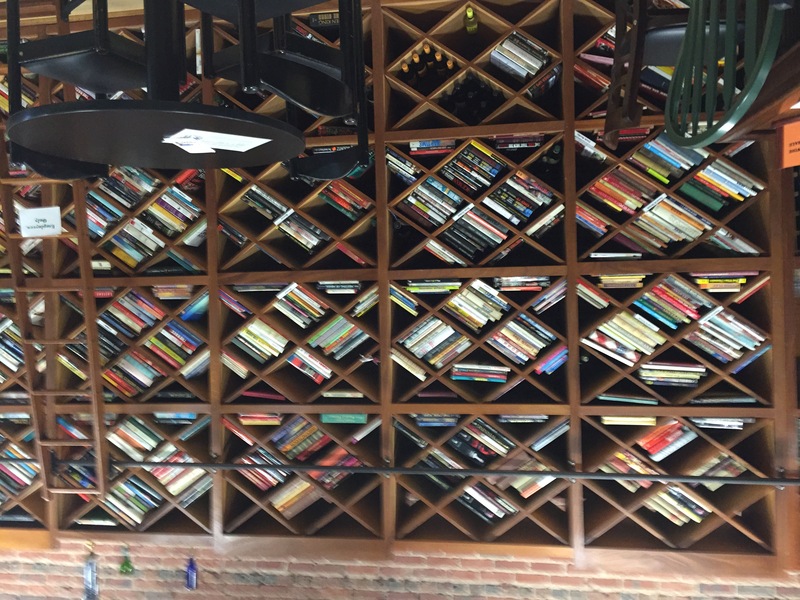 Then there are the independent bookstores, as is true with other businesses, that strive to bring to life their personality, as unique and distinct as individuals. When you find those places like The Java Place and Joe’s Place, you choose to return to them every chance you can as with old friends. 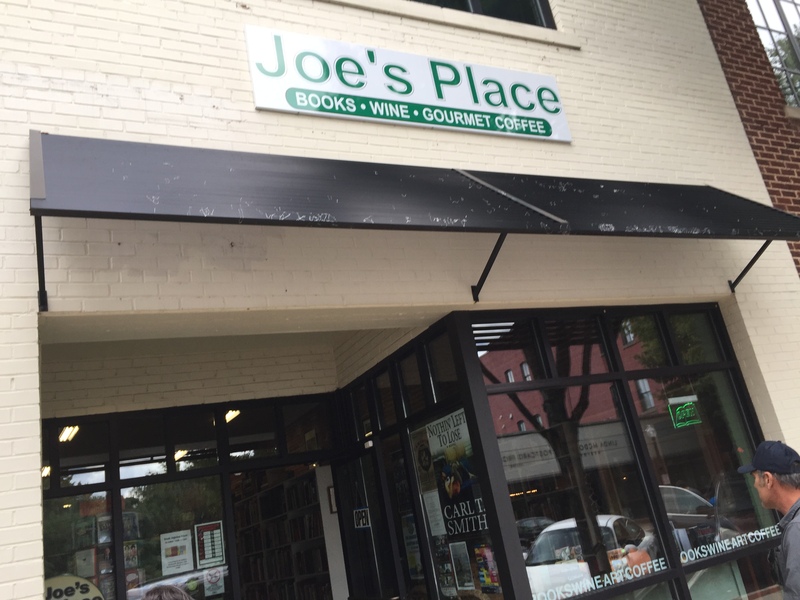 The storefront indicates that Joe’s Place sells books and wine, which opens lots of questions as to what I would find. Is it an antiquarian store? Perhaps it’s a wine seller with books on the side? A moment’s concerning thought arose: Did I just drive almost an hour to Greenville SC for a bookstore that was actually a Party Store? At this point, I just had to know. Crossing the threshold, a bar counter and tables were center of the room. Wine bottles stacked alongside, and a sign displayed prices for wine and…coffee drinks? Classical music soared through the room. 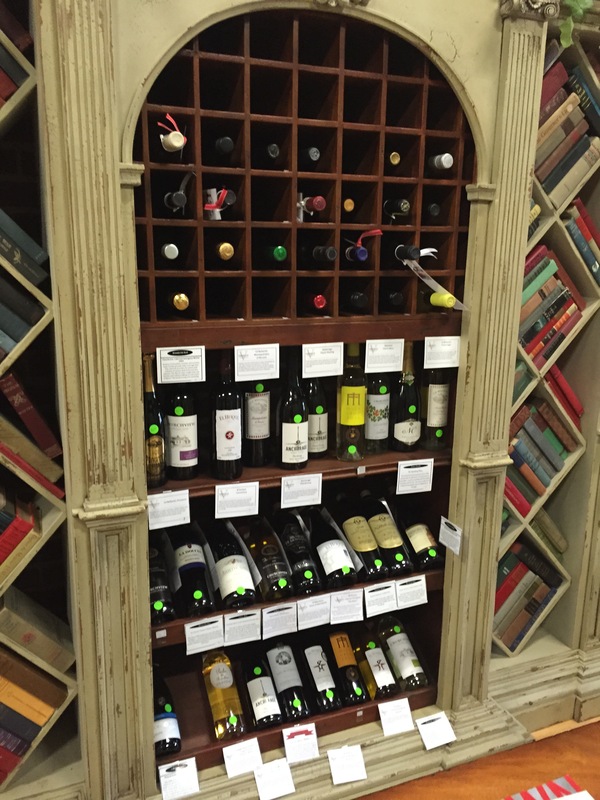 Diamond shaped shelves constructed for wine bottles were stuffed with books. It was then that I exhaled. There were many shelves of books in the main area, and the corner room near the back. All genres are present for the voracious reader, the teen, the parent looking for something to occupy their young child, and those who are interested in all things non-fiction. But that’s not all. There is a glass cabinet, once the home for expensive bottles of wine, that houses antiquarian volumes for the selective book collector. There is truely something for everyone’s book interest. The proprietor sat behind a register counter that was typical of book sellers I’ve found everywhere along my travels. The owners are a husband and wife team who shared a dream of establishing a bookstore to serve the local patrons. Prior to the store, they traveled far to visit their favorite bookstores. Interestingly, Joe’s Place is not named after either of the couple, but is named in honor of a brother. The reason for this was not shared. There was a sense of reverence in the silence that followed sharing the origin of the store’s name. 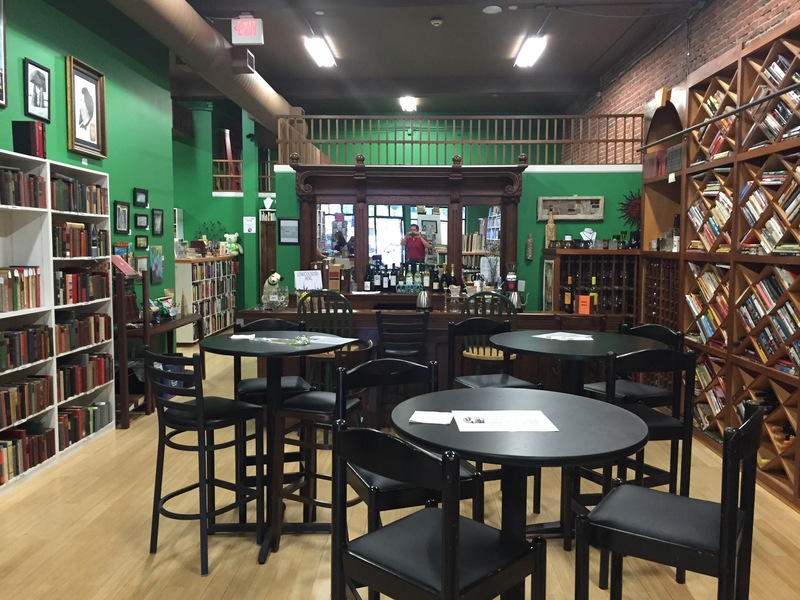 Joe’s Place offers an ambiance that is part bookstore, part cafe, and part wine tasting soiree. It is a place, as the proprietor said, “Where you can have a coffee or glass of wine while checking out books to decide on purchasing.” The downtown area where the store is located feels like a mix of an upscale college community and yuppy climate that welcomes tourists to walk the streets and visit the eclectic shops. 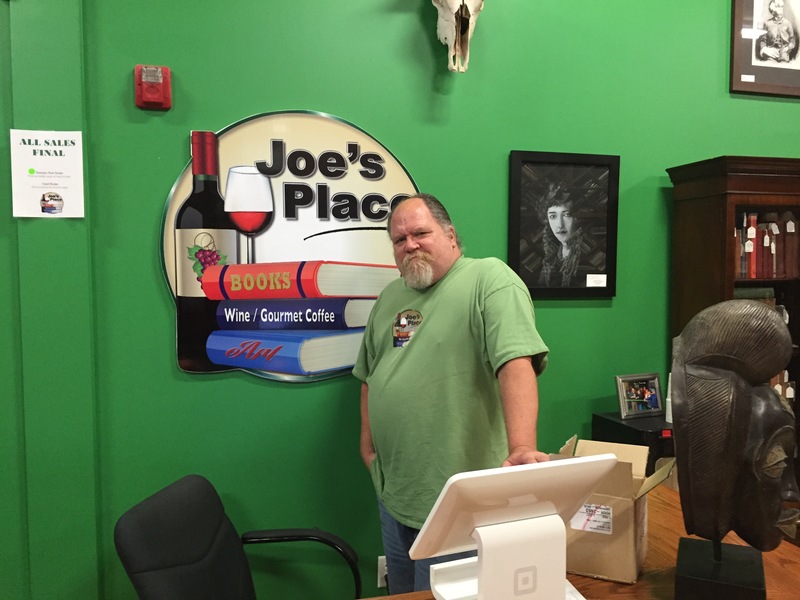 Joe’s Place is a welcoming stop for locals and visitors to catch their breath, have a drink, and check out a good book to start and purchase for their journey. Visiting bookstores on your travels must be satisfying. I hope there will be bookstores always open and welcoming to those of us who enjoy them. What a great concept mixing books and wine. Will definitely visit if I get the chance. This bookstore sounds amazing. Whenever I’m down that way I’ll have to stop in and have a glass of wine and read a book. You’ll love it. The area is very family friendly. Sounds magical…having a glass of wine and browsing through the books. What a relaxing time! I envy you! Keep a look out for Pat Conroy’s Prince of Tides in 1st for me. My dog ate mine!